I'm thinking i'd take the sail to a sailmaker and ask what's going on. If it had been present on the leech, as well, I would have thought maybe it was a sacrificial UV strip that was failing. Best time and money I've spent on the boat was having someone go back/forth docking with me. Learned a ton about that particular boat handled. The most important things were learning how poorly it handled going too slow (and how much power/distance was needed to stop it) and where turning points would be that would be past the point of no return. As in, don't let the boat get crabbed too far off a straight course, otherwise there won't be enough room to swing the boat out of trouble. Knowing where the boat pivots is crucial for this. You want to get it in your frame of reference to know just how much room you're going to need for the stern to swing around during turns. You can't let the boat get too far over one on side of marina fairway and you'll have no chance of pivoting the boat toward the other side because the stern will kick out. I keep it in my head where the point will be that I'll have to abort a docking and make a do-over. Or, more importantly, where the point will be that the boat will get damaged and wreck our upcoming plans. I'd rather spend some extra time re-doing the docking instead of waiting days/weeks for fiberglass repairs to be finished. I assume the pier has pilings. If you have a couple of extra fenders, if it's really windy, you could make up something like this: Sail Delmarva: Fender Boards. If you get blown to the pier, no big deal. Also make up a heaving line (1/4" dia. line with a weight at the end). Toss it to one of the spectators on the float. They pull in the heaving line which is attached to your dock line (long enough to reach, of course). They fasten the dock line for the bow, then you repeat the exercise for the stern. Now it's just muscle (or winch) to haul yourself across to your berth. I've never seen that before, seems like a good idea if we're continually getting pushed against the pier! Also, I have an update (or two, rather!). 2) Wife and I went out with a buddy on Sunday. Very little wind, but just enough to move us at a couple knots and relax. Coming back in, we pulled up against the end of the slip and friend disembarked while wife held boat. Then he grabbed midships springer and guided the bow while outboard moved the stern. As usual, there were random onlookers at the pier and one said "nice and easy!". If only she could have felt my trepidation and fear of another "incident", ha! Thanks all for the tips/tricks, super helpful. Now on to figure out what the heck is going on with our mainsail. The best thing about your adventure is you are doing it right. You bought a boat to learn on, and occasionally beat up. You're asking for advice and learning, learning, learning. Once you've, mostly, figured it all out you can upgrade to that boat you've always loved....and you'll know how to keep her safe for years to come. Funny enough, that's exactly what we did last time...only the cleat wasn't a cleat, but my buddy holding the line . There's a large pole going straight up through the end of the dock, makes it difficult to get a line over the cleat itself. I have to say that I've never found it reliable to use a person to act as a means to secure a line well enough to make tight boat maneuvers. They're just not strong enough and the risk for potential injuries is too great. A friend had a guest lose a thumb because a line got ensnared around it suddenly. If there's a pole, and this is your assigned home port slip, then what about setting up a means to leave a permanently secured line accessible for when you return? Like putting line on a hook on the outside of that pole when you leave? Pick it up on approach and immediately secure it around a cleat on board. Keep it a known length and anchored at a known point such that you can 'get used to' docking with it. And if not a hook or line coming up from a cleat then how about having a loop ready to lasso the pole to do the same thing? Just have an 'do-over strategy' in mind if/when lassoing the pole gets missed. It might even be workable to have two lines ready for the purpose. 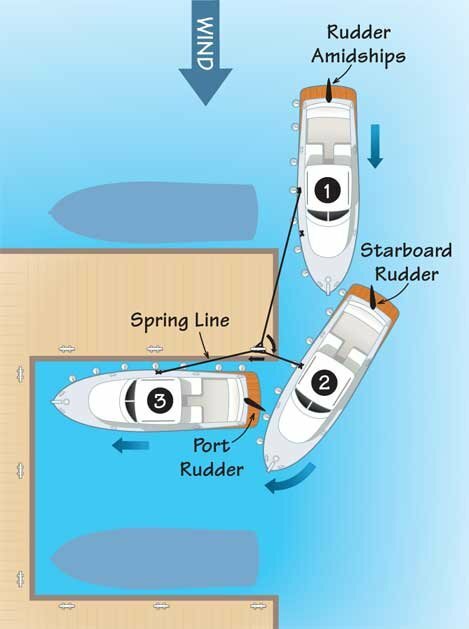 One at the bow, held tight to initially force the bow to turn hard to starboard, then loosened to allow continued motion and then one amidship/stern to keep the boat close to the pole while other lines are picked up from the dock (or likewise lassoed from the bow). There's a lot more force to be maintained when you get a line around a cleat, even if it's just around once and up against the underside of a horn. You can step on the line and restrict it with a lot more force than just pulling with your hands/arms/back. With considerably less risk of injury or being pulled off-balance. All of those are good points. I should mention however that this is our last trip in this slip. The marina was kinda enough to let us take over a different and more convenient spot that doesn't back up into the pier. Our current slip only has about 6ft of extra space to move around in, really difficult. In addition, there are two large underwater pipes that poke out, each one being only a foot or two under the surface (exactly where our outboard prop sits). I'm looking forward to continuing to learn how to dock in a more traditional slip setup; I've never had issues doing it in the past, but just in reading this thread I have discovered things I've been doing wrong so it's time to build some new/correct habits!